This is a Premium - High Capacity system designed for 1997 Thru 2002 MerCruiser 4.3L V6 engines with serpentine/single belt and NON-DRY JOINT exhaust. System can be utilized on Sterndrive and Straight inboard applications. System will not fit engines with the power steering mounted high on the port side (higher than the valve cover). Don't make the mistake of being sold strictly on pricing. This particular product is priced slightly higher than other standard after market systems. However, this system is the only "OEM" duplicated product on the market, even manufactured by the same company that produces the OEM systems for Mercruiser, Volvo Penta, Yanmar, Westerbeke, Polaris, and others. Why does this matter? This system utilizes a higher number of cooling tubes, more passes on the sea water portion of the cooler, as well as "sealed" dividers. These systems are also the only after market systems that utilize a bypass style of thermostat which fully flows the engine and exhaust manifolds, even during warmup. What this means from a functional standpoint is that detonation is reduced since steam pockets are prevented from forming due to the high coolant flowrate especially during warmup. This is the same design technology used by Mercruiser and Volvo Penta on their OEM systems. 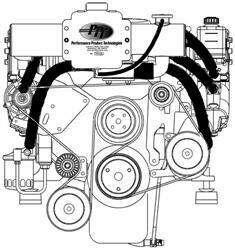 Includes carb, EFI and MPI. Heat exchanger is 4-1/8" diameter x 23-1/2" long and fits within overall length, width, and height of most engine conversions (adds 1-1/2" to overall length of 2001 and newer MPI installations). Heat exchanger extends from extreme starboard side of a normal exhaust manifold towards port side. Plastic expansion tank mounts either on front of heat exchanger or if space is limited it can be mounted on a vertical surface next to engine. If dry joint exhaust system equipped (V8 serial #0m300000 and above, V6 serial #0m615000 and above), THIS IS THE WRONG KIT; you must purchase kit #5320-6B .